The representation of the veiled woman has become an important issue for postcolonial feminists who want to emphasize the importance of understanding localized meanings and knowledges rather than accepting the outside, Western viewpoint as the dominant truth. Although in Persepolis Marjane Satrapi represents the veil in a way that is consistent with a Western viewpoint of it being part of a systematic oppression of women, she also counters the representation of Middle Eastern women as passive, oppressed and monolithic by illustrating acts of overt and subtle resistance to the veil and the regime and by emphasizing the individual identities of women beneath the veil. 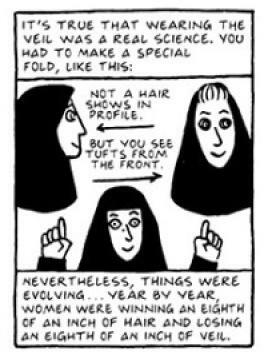 The very first page of Persepolis establishes the comic’s resistance to the Western image of the veiled woman. The first panel shows a ten-year-old Marjane, seated, the black veil surrounding her cartoonish face (Satrapi 3). The second panel shows a group of Marjane’s classmates similarly veiled, with Marjane just out of the frame to the left (3). Monica Chiu, in “Sequencing and Contingent Individualism in the Graphic, Postcolonial Spaces of Satrapi’s Persepolis and Okubo’s Citizen 13660” reads these panels as “representing Marji as both an individual girl and a member of her class” (102). Far from the stereotypical, homogenizing representations of veiled women common to the western media, the simplified cartoonish style of Satrapi’s artwork forces the viewer to notice the subtle variations Satrapi has given each of the girls—differences in hair texture, eye shape, and expression (Satrapi 3)—affirming them, as Chiu says, as individuals, but also as part of a shared experience. At the bottom of the page, in perhaps one of the most iconic images from Persepolis, the group of girls is shown refusing to wear their veils—some complaining it is too hot, others using their veils to play-act political or fantastical games, and others jumping rope with them (3). This image of even the youngest women resisting wearing the veil in a variety of creative ways runs counter to the images presented in the Western media of passive, victimized women who are oppressed and flattened into a monolithic group by wearing the veil. This trope of resistance to the veil continues even after the regime has become increasingly powerful and all women are required and forced to wear the veil. Emma Tarlo, in her “Sartorial Review” of Persepolis notes that “more subtle indicators” (349) become the way to distinguish between the fundamentalist and more secular men and women. Satrapi represents this with a drawing showing the slight changes in stylings that people adopt to make visible their resistance to the regime (Satrapi 75). Early in the comic, some acts of resistance to the imposed clothing are even more bold; while still relatively young, Marjane is stopped by the Guardians of the Revolution for stepping into the street wearing a denim jacket and Nike sneakers over her veil in an attempt to align herself with the forbidden Western youth culture she adores (133). An embrace of Western appearance through clothing is shown to be an act of resistance for Iranians, particularly Iranians who, like Marjane at this point, have not been to the West and experienced alienation or isolation there. Much later, when Marjane returns to Iran after spending time in Vienna, she discovers that her friends have adopted what Marjane initially sees as a superficial interest in Western standards of beauty – “They all looked like the heroines of American TV series” (259). Marjane later realizes that wearing makeup and adopting Western beauty standards is “an act of resistance on their part” (259). Marjane herself is easily identified as having been an outsider for some time due to her inability to wear the veil in the sneakily fashionable way that the other women do (293). While on the surface this expression of resistance through an embrace of Western culture appears to support western liberal feminist ideology, the fact that these women demonstrate agency and independence, not relying on outside forces to enact political change, problematizes this simple reading. Subtle markers of resistance to the universalizing nature of the veil become increasingly important over the course of Persepolis as a way to visibly communicate political ideologies and also individual identities. Instead of the passive women accepting the enforced veil-wearing usually represented in the Western media, Satrapi represents women resisting the authority of the regime through their clothing and their bodies, and also represents them as individuals while still wearing their veils. The acts of resistance to the regime are perhaps so subtle—having to do with slight reconfigurations and small details such as wearing red socks—that they may not even be noticeable or understandable by an outsider without Marjane as a guide. This representation complicates, if not outright displaces, the Western stereotype of the veiled Muslim woman being passively oppressed.